Please answer the questions below so we can get you the information you need about the Lem's Opportunity. Thank You. This is not an offer to sell a franchise. A Lems Bar-B-Q franchise is offered only by our delivery of a Franchise Disclosure Document to you in compliance with FTC Rule 436 and various state franchise sales laws. 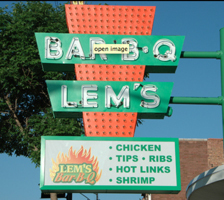 This website information is not directed to any person in the states in which Lems Bar-B-Q is not registered, by or on behalf of the franchisor or anyone acting with the franchisor's knowledge. No franchises can be offered or sold until the franchise offering has been authorized by the appropriate regulatory authority, and the Franchise Disclosure Document has been delivered to you as required under applicable law.